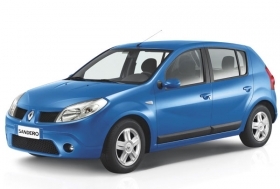 The arrival of the Sandero has helped lift Dacia's Europe sales. Fiat, Hyundai and Dacia had sales increases in April thanks largely to government subsidies that reward people who buy inexpensive subcompact and compact cars. "Because of scrappage schemes, many people are rushing to buy affordable cars. When people are looking for bargains they automatically think of brand of brand like Dacia and Hyundai," said Christoph Stuermer, an analyst at IHS Global Insight's office in Frankfurt. April sales at Renault low-cost brand Dacia increased 60.4 percent to 23,654 units, according to figures released Thursday by the European auto manufacturers association, ACEA. Hyundai's volume rose 9.7 percent to 27,454 units while Fiat brand sales climbed 5.4 percent to 99,918 units. The gains come in a market that fell 12.3 percent to 1.4 million units last month. Car buyers in Germany, Italy and France can get a scrapping bonus of 1,000 euros to 5,000 euros for trading in their old cars for newer models. Spain and the U.K. are about to offer similar incentives. The scrapping plans also protected April sales at Volkswagen brand and Ford. VW brand was down 0.2 percent while Ford was off 1.5 percent last month. Through four months Hyundai's sales are up 11 percent to 108,034 while Dacia's rose 6 percent to 65,122. The overall European market was down 15.9 percent to about 4.7 million cars during the first four months. Unlike mass-market brands, makers of luxury cars and SUV are getting little help from the scrapping incentives. In April, Mercedes-Benz sales were down 26.9 percent to 51,855 units, BMW slipped 33 percent to 44,676 and Land Rover dropped 45.6 percent to 3,950. People who are scrapping 9- and 10-year-old models "do not have the money set aside to buy more expensive cars," Stuermer said. Ford expects 400,000-unit sales surge in Spain, U.K.